This study utilizes chat logs obtained specifically from Yahoo! Chat. It is a chat system provided by Yahoo! Inc. for free. It is a popular electronic environment which people enter in order to interact with others from around the globe via the Internet, at any hour of the day or night. It can be accessed from Yahoo! Messenger or from http://chat.yahoo.com. Before anyone can join Yahoo! Chat, they must first have a Yahoo! ID with Yahoo.com. Yahoo! Chat is relatively easy to learn. It contains hundreds of channels, in which different conversations are held. The types of channels vary widely. Some are identified by the name of a country. Other channels are for people with common interests. There are also channels geared towards particular age groups. Each channel has different rooms so that it would not be too crowded in any particular public channel. Communication using the Yahoo! Chat is written, but it is also synchronous. It is a written (typed) form of communication that is transmitted, received and responded to within a time frame similar to spoken communication. In Yahoo! Chat, users can manipulate the display on the chat window, such as font type, font size, font colour, emoticons and the background of the chat window (only available in Yahoo! Messenger). ● spoken conversation can be said to follow a normative ideal of precisely alternating turns, it refers to the timing of the transition from one speaker turn to the next, which is ideally supposed to occur with no (or minimal) gap, and no overlap between speakers. ● alternating because it is expected that participants will take turns speaking in orderly fashion. Thus, in dyadic exchanges, one person speaks, the other responds; the first speaks again, the second takes the following turn, and so forth. ● Computer networks – originally intended for data transmission, not social interaction. Thus, researchers in CMC found – various limitations imposed on group interaction by the properties of the medium, such as high production and reception, and “chaos”. ● One of the properties of the medium which are obstacles to interaction – lack of simultaneous feedback. Online chat is text-based, and chat participants rely on fewer channels than face-to-face interaction for transmission of the message. Because users do not see other participants, they do not have access to paralinguistic and non-verbal information, which are equally important as the verbal information in interaction. ● Another feature is the fact that most free chat systems make use of messages are sent in their entirety when the message originator presses “send” or “return”, rather than one keystroke at a time. Therefore, participants cannot respond while to message is being typed, and they do not even know that are being addressed to until a complete message appears on the screen. As a result, discontinuity and overlap within turn sequence occur. ● Another problem is disrupted turn adjacency, which is due to CMC systems transmitting messages linearly, in the order received by the system. Thus in multi-participant interactions, a message may be separated in linear order from a previous message it is responding to, if other messages are been sent in the meantime. Delays in message transmission, or “lag”, also result in “speaking turns” appearing in chaotic sequence. When adjacency is disrupted, users may experience difficulty in tracking sequential exchanges, and interaction may become fragmented as a result. ● In online chat, overlap, disrupted adjacency and interleaved exchange are very common. 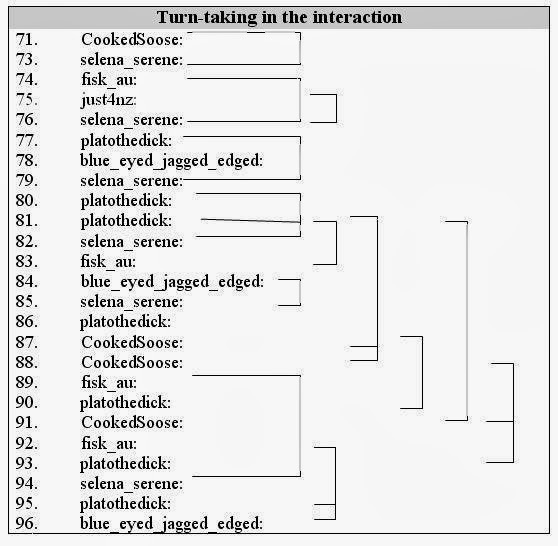 Time taken to type a message and system lag in multi-participant interaction cause speaking turns to be lines away from one another, if messages from other participants intervene. This can be seen in the example 1 (messages generated automatically by Yahoo! Chat system are excluded from this analysis). ● In the sample above, because of the number of participants the chat room in the study is high, exchanges were overlap and interleaved. Here, we can see that the participants respond upwards to a previous participant in each case. ● One interaction is between platothedick and selena_serene, fisk_au and CookedSoose, and another is between blue_eyed_jagged_edged and selena_serene. We can see that selena_serene was engaged for a moment in two interactions at the same time. ● Later (line 88), fisk_au initiated another conversation with the rest of the participants in which the responded to. Example 1 shows that exchanges overlap, rather than in sequence, and turns are often disrupted by other messages in between. 87. CookedSoose: it’s your birthday plato??? ?